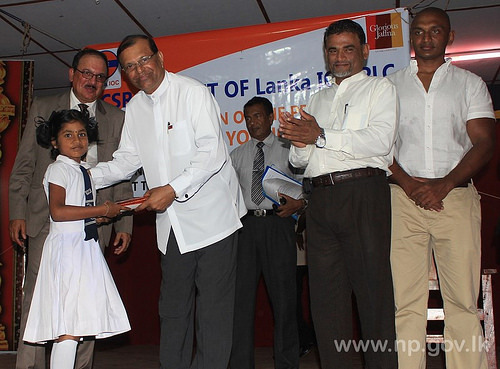 The students who have completed the “English for Young Learners” – A course conducted through CSR Project of Lanka IOC to the school children in Jaffna were awarded by Governor of Northern Province GA Chandrasiri. A ceremony in this regard was held on 21st April 2014 at Veeramani Iyar Stadium, Kopay Teachers’ College. The Governor participated as chief guest and awarded the students. 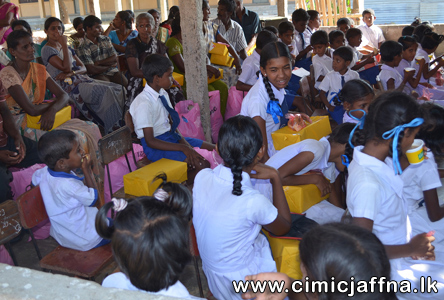 Lanka OIC has organized this six – month English Course in partnership with ‘Glorious Jaffna Foundation’. 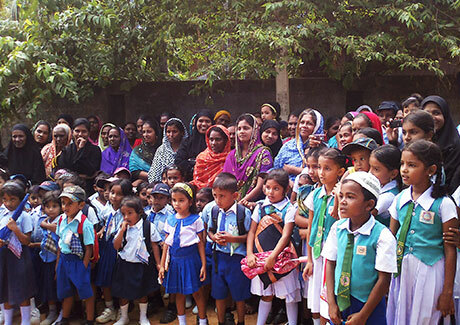 150 school children who completed this course were awarded with certificates. Secretary to the Governor L.Ilaangovan, Managing Director of Lanka IOC Dakbala, The Director of Glorious Jaffna Foundation Tharindu Amunugama and The First Secretary of Indian Consulate, Jaffna Suresh Menan also participated at this ceremony. Pre-School Education Bureau is taking measures to raise awareness on ‘Importance of Sending Children to Pre-Schools’ through street dramas. 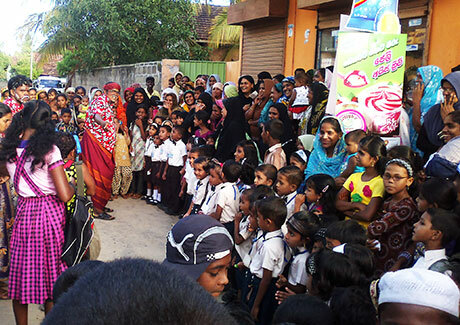 In this regard, a street drama was staged on 25.11.2013 at public places in Nintavur and Akkaraipattu. Secretary to the Chief Minister Mr. U.L.A. Azeez officially inaugurated the event. Large amount of audiences and dignitaries of the area were present on the occasion. Economic strengthening programme and distribution ceremony of supporting aids to disabled people was held at the main hall of Kilinochchi District Cooperative Board on 15th May 2013. Minister of Traditional Industries and Small Enterprise Development Douglas Devananda and Governor of Northern Province GA Chandrasiri participated as chief guests. Those who lost their limbs were provided with 2000 rupees at first stage. 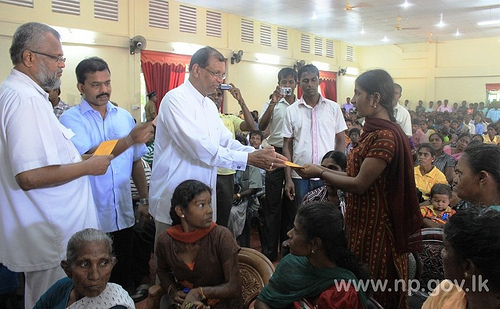 Minister Douglas Devananda , Governor G A Chandrasiri and parliamentarian M.Chandrakumar offered the cheques. Above all, every week 5 people with limb loss are going to receive assistances on priority basis. “An artificial limb producing factory is to be set in Kilinochchi at a cost of 12 million rupees very soon.” Minister said. In his address Governor stated that a scholarship scheme will be introduced to the children from the family which lost their limbs during the war or natural cause. It is necessary to find disabled people from other districts of Northern Province and fulfill their needs. For this purpose large amount of fund is spent every year through Ministry of Social Services and other projects. Govt. 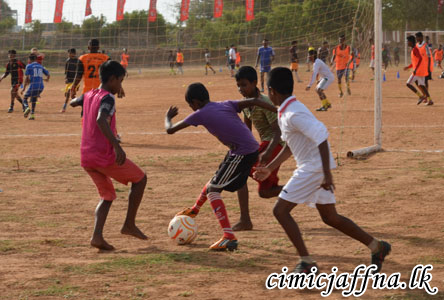 Agent of Kilinochchi District Roobavathy Ketheeswaran and Karachchi DS Division Secretary Nageswaran also took part at this event. 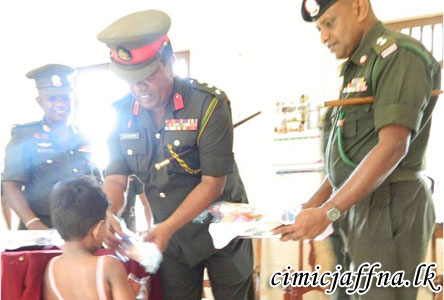 A Sri Lankan expatriate living in the US, pleased with ongoing welfare projects by the Army for Jaffna civilians, has come forward to assist the Army in its community projects. Mr. Nagulan, an engineer, and his wife Mrs. Mary Perin, on request of the Army, donated a stock of footwear worth of Rs. 35000/= to students of J / Kaddaikadu Roman Catholic Tamil Mixed school. The donation was handed over to the recipients by General Officer Commanding 55 Division Brigadier Ajith Wijesinghe and the principal of the school in the presence of teachers and parents. Senior officers of the 55 Division, Brigades and Battalions were also present.